We believe that cosmetic dentistry is more than enhancing the beauty of your smile, but also restores and preserves a healthy set of teeth for years to come. Our office is equipped with latest technological advancements enabling us to deliver outstanding modern care to all of our patients. Combined with regular at-home oral care and periodic dental checkups for professional maintenance, you’ll be able to maintain your great-looking smile long into the future. Our practice provides comprehensive care at our Santa Fe cosmetic dentist practice to repair damaged and discolored teeth, and restore the natural beauty of your smile. Our cosmetic dental services include dental implant restorations, composite fillings, inlays, onlays and dentures. For each patient, we look at your care holistically to customize a treatment plan and recommend restorative procedures that are right for you. We understand how important cosmetic dentistry can be. For over 30 years, Santa Fe cosmetic dentist Dr. Martin has developed a craftsman-like approach to the creation of inlays, fillings, and veneers that provide superb results. We have invested in the latest technology in cosmetic dentistry to give our patients an attractive smile while also improving form and function. Advanced tools allow us to restore your teeth to its original condition with minimally invasive techniques, while recent innovations in technology protects more of your tooth structure than ever before. Dr. Martin utilizes a state-of-the-art CEREC machine, which uses computer-aided design technology to create customized dental restorations within minutes—that means we can mold, manufacture, and fit ceramic restorations in a single session, making the process quicker, easier, and less stressful for you. Our practice also uses durable materials like ceramics, which greatly improve the aesthetic appearance as well as the longevity of the restoration. Opalescence teeth whitening and brightening is a quick and simple way to enhance the look of your teeth, by removing stubborn stains such as those caused by coffee and nicotine. The service is often done in the office, we then make an impression of your teeth and produce a plastic "tray" in which the brightening can be done periodically at home. Sensational smiles are available for people who qualify for the procedure. Bonding and filling composites used to create inlays and onlays and fill cavities. Composites are durable, tooth-colored synthetic resins that improve the surface appearance of individual teeth. These restorative methods are used to repair damage caused by tooth decay or injury to the tooth. 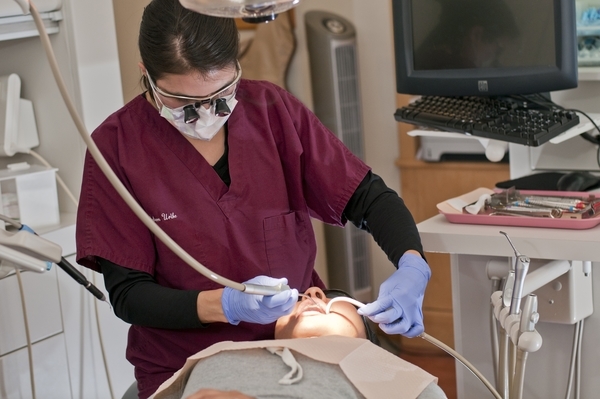 With your health and safety in mind, we do not use mercury-amalgam fillings in our Santa Fe cosmetic dentist practice. Porcelain veneers are great for smile make overs—they can be used on one tooth or your full smile zone as needed. Veneers provide the opportunity to entirely change the way your teeth look and fit within your mouth. Custom-created from a mold and then bonded to your own teeth, veneers are strong and resilient, and with proper care they can last for decades. At our cosmetic dentist office in Santa Fe our motto is simple: your customized care is our passion. That means we offer the dental solutions that are tailor-made for your needs, and it means that we’re dedicated to providing exceptional customer service, and a dental experience that’s as pain-free and comfortable as we can make it.